Just like a pebble thrown into lake, the ripple of a simple action can create the start of something larger than itself. On October 16, 2017, I received a “what’s up!” text message from my friend, David. We were exchanging messages about results in recent professional tennis matches. He was also checking in to see how I was doing after finally reaching our fall/winter home in Chiang Mai after several months of traveling around Europe, the US, and South America. At the end of his message, he said, “planning my [Asian pacific] trip and want your input.” In just one month, David was planning to retire and embark on a, yet to be defined, trip around South East Asia. Over the next several days, that one minor sentence in his touch base text message turned into a flood of messages back and forth between Thailand and Florida discussing his possible itinerary. At the same time, he kept poking me about finally making our once distant dream of attending the Australian Open together a reality. In the end, he settled on keeping his itinerary very fluid and simple, something easy to do when you’ve spent the last 40+plus years of your life working – the last decade or so of which was spent hopping on planes once or twice a week as a business systems consultant. By his official retirement day on Nov 17, 2017, he only had a few stops planned. He’d start in Los Angeles to visit friends and spend a few days playing in a tennis tournament at the Indian Wells Tennis Resort near Palm Springs. Thereafter, he’d fly to Hong Kong for a few days and then visit me in Chiang Mai, Thailand. His time in Chiang Mai and every moment thereafter was undefined, yet by the end of his 2-month retirement adventure, he’d visit 14 cities in 8 different countries. Little did I know when I received his initial message back in October that I’d end up joining him along his journey in four of those cities in two different countries. David and I initially met as coworkers in the Human Resources Department at Stanford University Medical Center back in the late 2000s. This same guy who used to call me “Slick”, make fun of my ebonics way of saying the word “ask”, and bust my chops at almost every opportunity, eventually became an esteemed mentor for me on the tennis court. 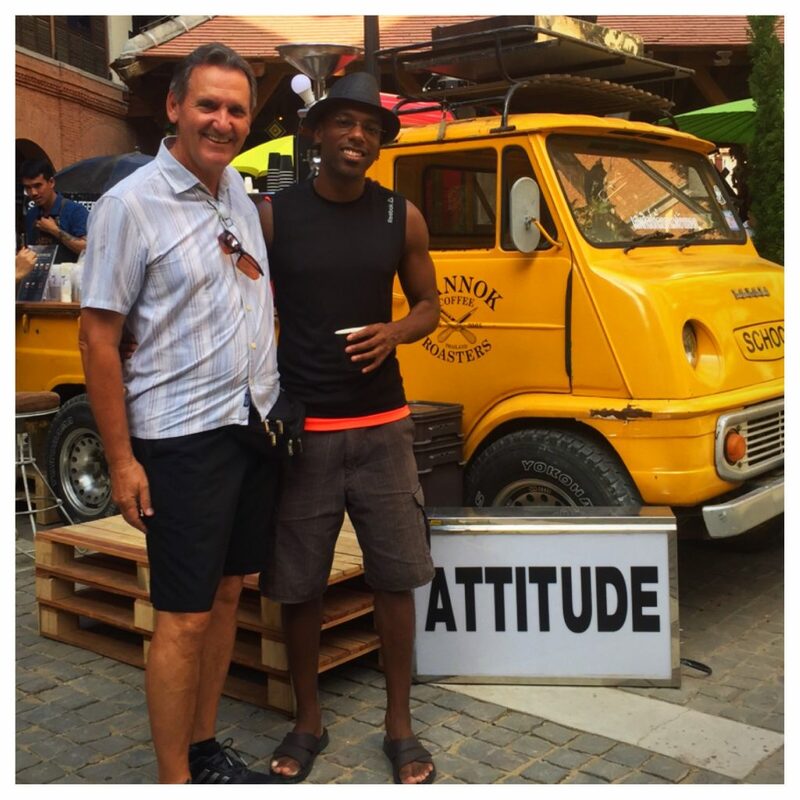 David had played tennis for years in amateur tournaments and as we slowly began to get to know each other at work, we discovered our similar passion for the international sport. Soon, we’d burst into each other’s offices during the major tennis tournaments of the year to talk about the latest match results – including the famous victory by Roger Federer over Novak Djokavic in 2011 at the French Open, during the “Joker’s” magical run of undefeated matches during the start of that year. Since our departures from Stanford in July and October 2011, respectively, we’ve kept in touch, seemingly always exchanging messages around the dates of major tennis tournaments. We both attended the French Open in recent years but not at the same time. And since we began playing tennis nearly a decade ago, we’ve always talked about attending the Australian Open together. David had been once before but I’d never made the jaunt to the Land Down Under. For a variety of reasons, I held back on deciding whether to attend in 2018, though the newly retired traveler kept nudging me at every turn during our brief time together in Thailand near the start of his retirement trip. In the end, I gave in to opportunity. I realized that there would never be a better time nor better person with whom I could enjoy my maiden Australian adventure. After spending a few days together in Chiang Mai and Bangkok in December, we made last minute arrangements to meet just three weeks later in Melbourne. By the next time I saw David, he had been to six different cities in five different countries and yet his energy level was just as high as it was when we parted ways in Bangkok – which says a lot for a guy thirty years my senior. I arrived in Melbourne in the early morning of January 17 after a nearly a day and a half of travel. A few hours of that time was spent bouncing around my favorite spots in downtown Kuala Lumpur during my 9-hour layover, but most of it was spent packed in the sardine-like cabin seats of two Air Asia flights. The price you pay for last minute low fares. Riding into downtown Melbourne and walking from the main train station to our hotel, I kept telling myself “I’m not in Canada…this is not Montreal.” Yet, for never having visited Australia prior to my arrival, I felt like I was just north of the border back in the States. It’s a long way to go to feel like you never left home and honestly, if there was no tennis tournament in the city, at this point in my travels, I wouldn’t have much of a reason to travel this far to experience a place and culture so similar. Since we had both been traveling the last couple of days, we decided to make the first day in Melbourne a chill day – so to speak. However, “chillin” for David and I still involves exploration because neither of us likes to be stuck in the house or just laying around. 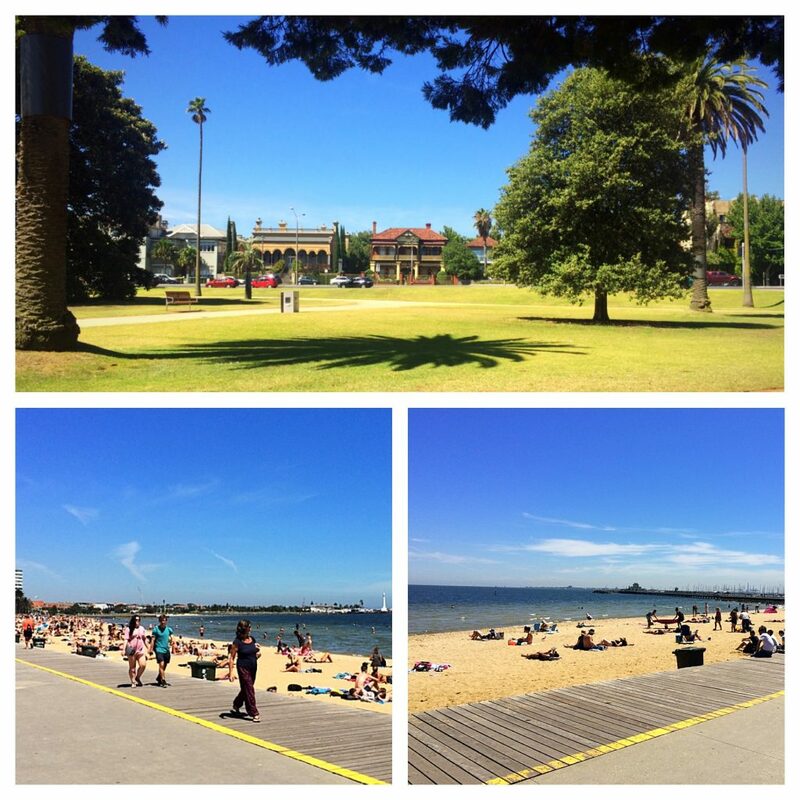 Instead, we ventured south to visit St. Kilda Beach and enjoy the first of many cigar chats in the nearby park. David and I had already spent about a week together in Thailand a month prior, and yet we always had so much to talk to about. Mind you, he had a lot of updates to share about his recent excursions through Vietnam, Malaysia, Singapore, Bali, and two other Australian cities since we last saw each in Bangkok just 3 weeks ago. Later that evening, walking back to our hotel, we spotted an outdoor viewing area setup by the local TV station to broadcast live matches from the tournament only a mile away. 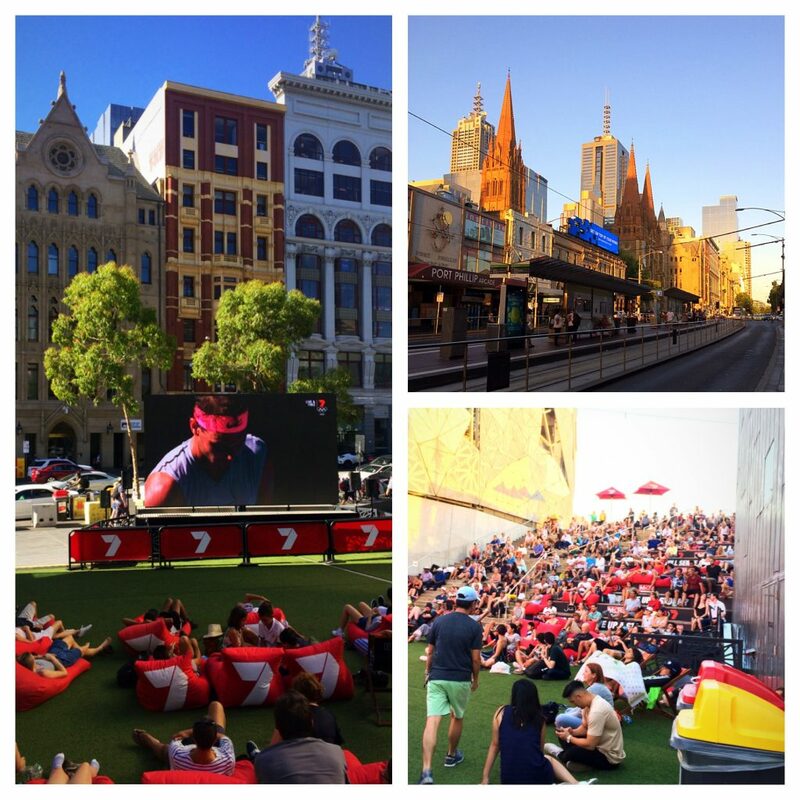 We decided to grab a coffee and pastry after dinner and enjoy the first of many matches on a warm, Australian summer night. The warmth that arrived on the eve our day at the Open turned into nothing but pure Australian summer heat. 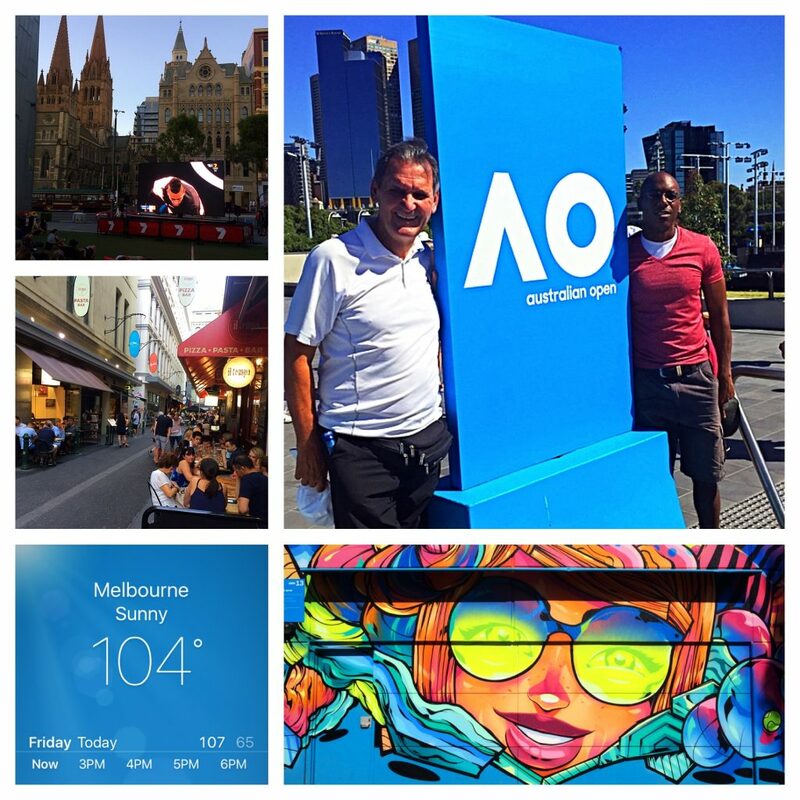 For years I’ve watched players and spectators brave the 104o F (40o C) temperatures in Melbourne during annual summer classic but it never crossed my mind that we’d have to endure the same during our two days at the tournament. Surprisingly though, it wasn’t as bad as one might think and it didn’t have any significant impact on the quality of our experience. During our first day, we were like kids in a candy store. We bounced around from court to court, sitting long enough to enjoy watching a set or two of some our favorite players – including Juan Martin Del Potro, Aga Radwanksa, Monica Puig, and Dominic Theim. We probably saw at least 7-8 different matches during that first day, some on outside courts (before the heat became too much) and some in the comforts of air-conditioned stadium courts. By the second day, both the heat and crowds began to take its toll on us and we opted to focus on a few key matches in the early part of the day before bidding adieu to our decade-long dream of attending this distant tournament. 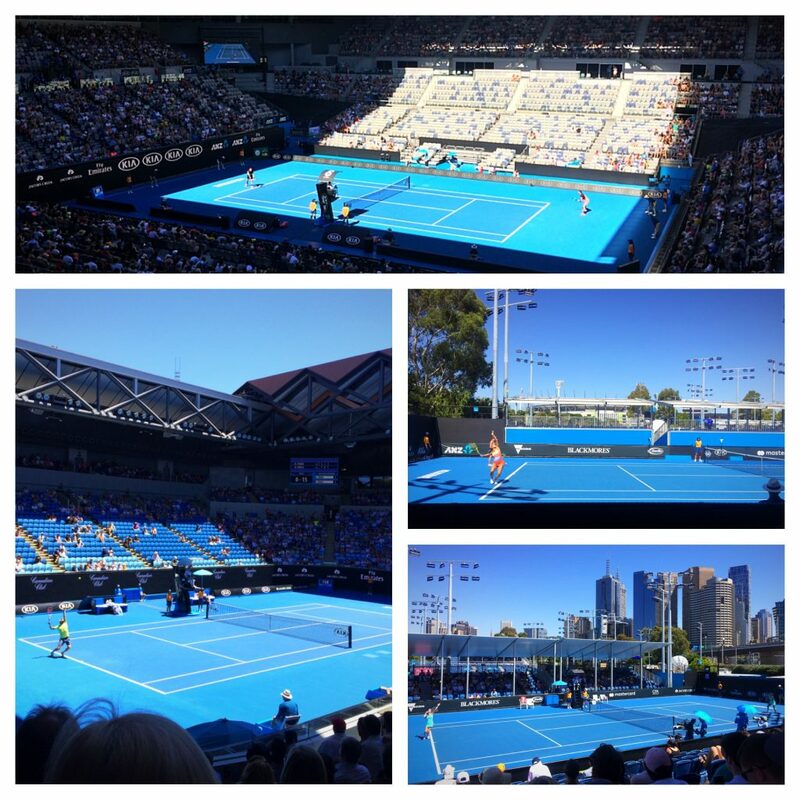 We saw singles, doubles, mixed doubles, men’s and women’s matches – nearly everything except wheel-chair and junior matches (which didn’t start until the second week of the tournament anyway). It was perfect though, since David and I both prefer to attend major tournaments during the early rounds so that we can bounce from court to court, seeing as many matches as possible. When we left the grounds around 1:30pm that day, the thermometer still read 104o F. Yet by the time we sat down at the outdoor viewing area in downtown Melbourne just 4 hours later, the temperature began its 40o F drop down to the mid 60s. We went from sweating at noon to shivering by 6pm. For the rest of the tournament the temperatures didn’t crack more than 80-85oF. 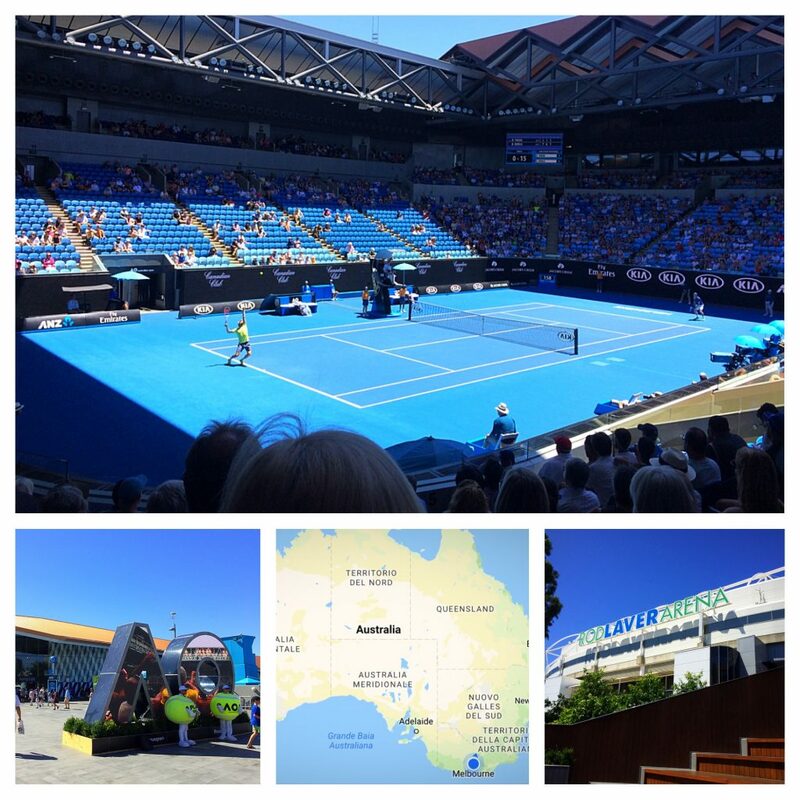 For my first (and perhaps only Australian Open experience), I wouldn’t have wanted it any other way. 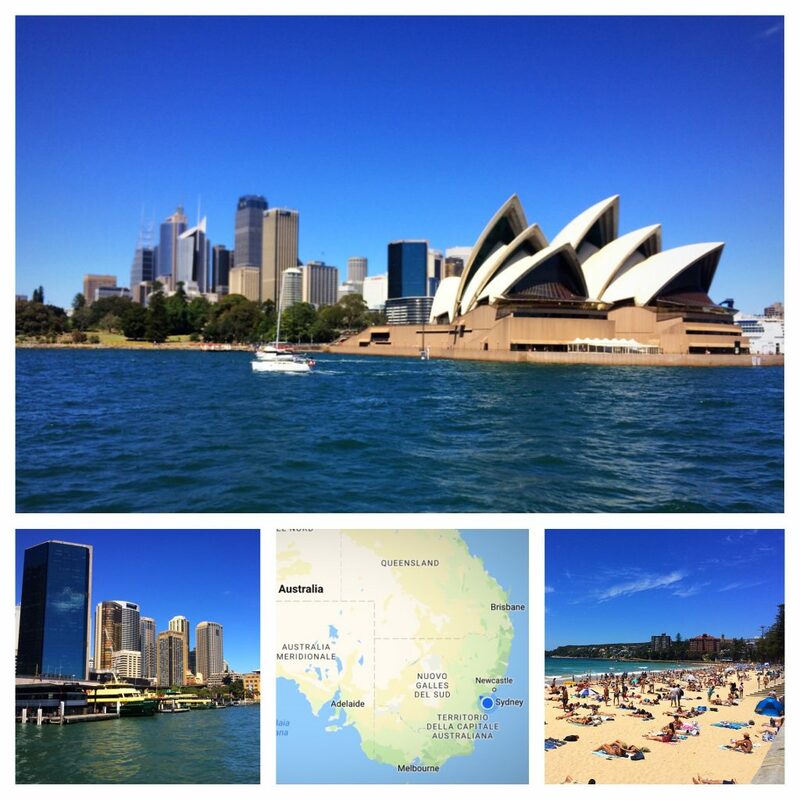 Whereas Melbourne felt much like Montreal and was really only a destination because of the tennis tournament, Sydney was like a true vacation destination. The bright blue skies, palm trees, and gleaming harbors were a welcomed, though initially confusing sight. As someone who had never been south of the equator, my initial orientation was a bit off. I was thrown by the fact that we traveled north, and yet the temperatures rose and the city felt more tropical than its southern counterpart. Upon our arrival, Sydney reminded me of a mix between Los Angeles and Seattle (without the clouds). By the end of our stay, the feel of the city left me describing it as a mix of LA and Seattle (visually) and New York, Martha’s Vineyard, and Washington D.C. (culturally). The city has a certain aura to it that clearly explains why there is natural friction between it and its southern, less pretentious counterpart. 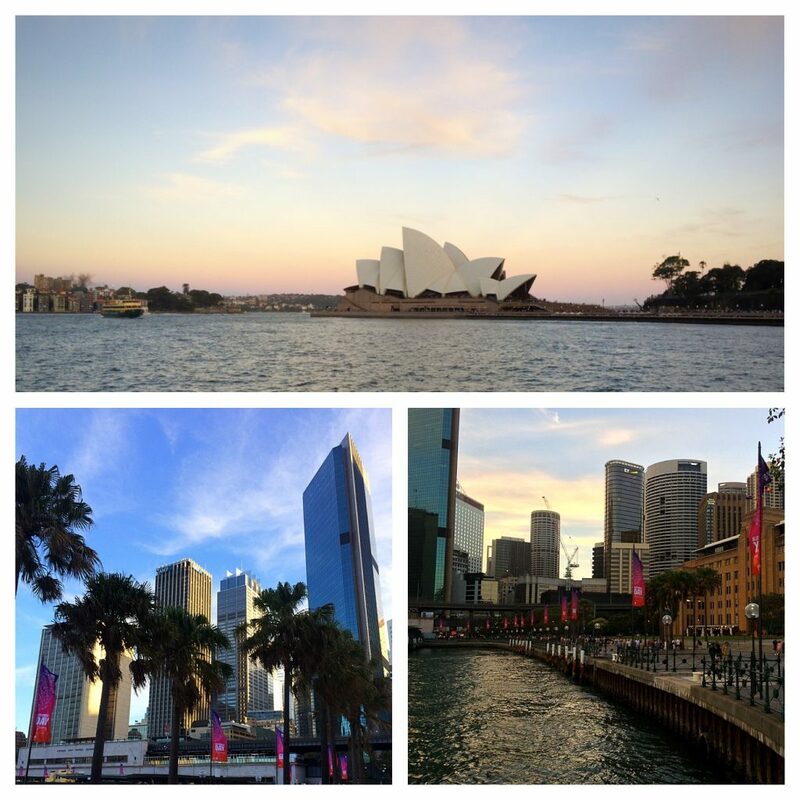 Not surprisingly, soon after we landed and checked into our hotel in downtown Sydney, we were on the move again. It’s comfortable traveling with someone with a similar rhythm. Both David and I like to get up and go. We typically pick two or three primary activities for the day and let the rest of the day evolve serendipitously. During our entire seven days traveling together and sharing hotel rooms in Melbourne and Sydney, we never grew tired of each other and we always had something interesting to chat about. That first evening, we walked around downtown to get our bearings and made our way to the most famous spot of all – the Sydney Opera House. 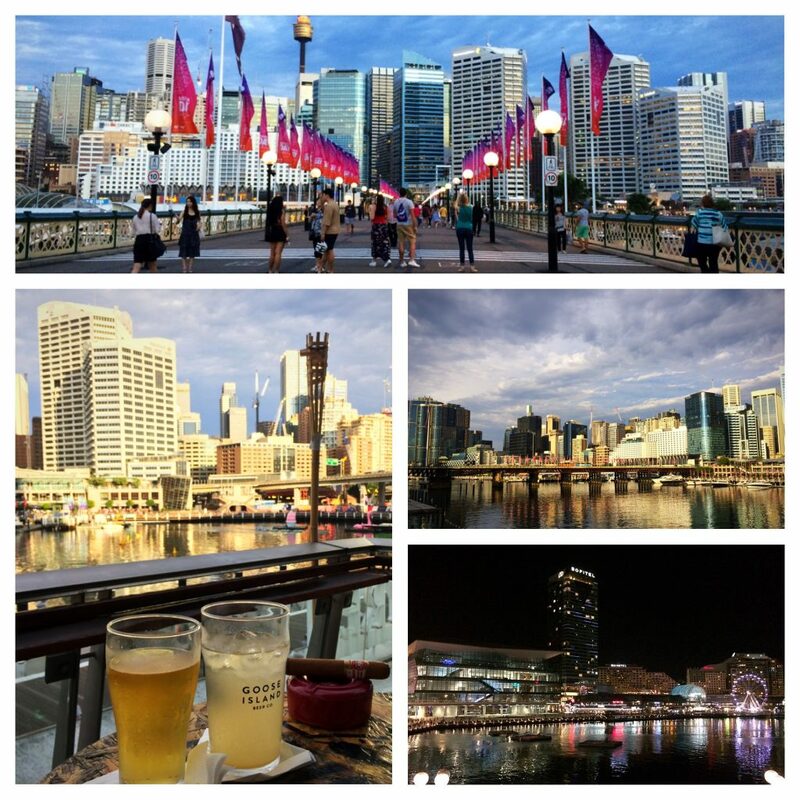 That was a beautiful welcome to the city and the first of many more nightly cigar chats while we watched the people of Sydney strut by. Over the next four days, we spent the mornings exploring the beaches and neighborhoods of the city, the afternoons relaxing at the hotel watching the second week of Australian Open tennis 400 miles away in Melbourne, and the evenings exploring restaurants and sitting at our now favorite spot – the Cohiba Bar at Darling Harbour. With a drink in one hand and a cigar in the other, we overlooked the beautiful harbor chatting about any and everything that came to mind. We peered across the harbor at the sea of office towers and thought about how much our lives had changed over the past decade. That past life created a friendship thousands of miles away, which was now closing the chapter on a dream that began on the Stanford University tennis courts nearly a decade earlier. It was also closing the chapter on David’s momentous South East Asia adventure. After saying our goodbyes in the early morning on January 24, David left the hotel and headed to the airport for his long return flight back to Los Angeles. 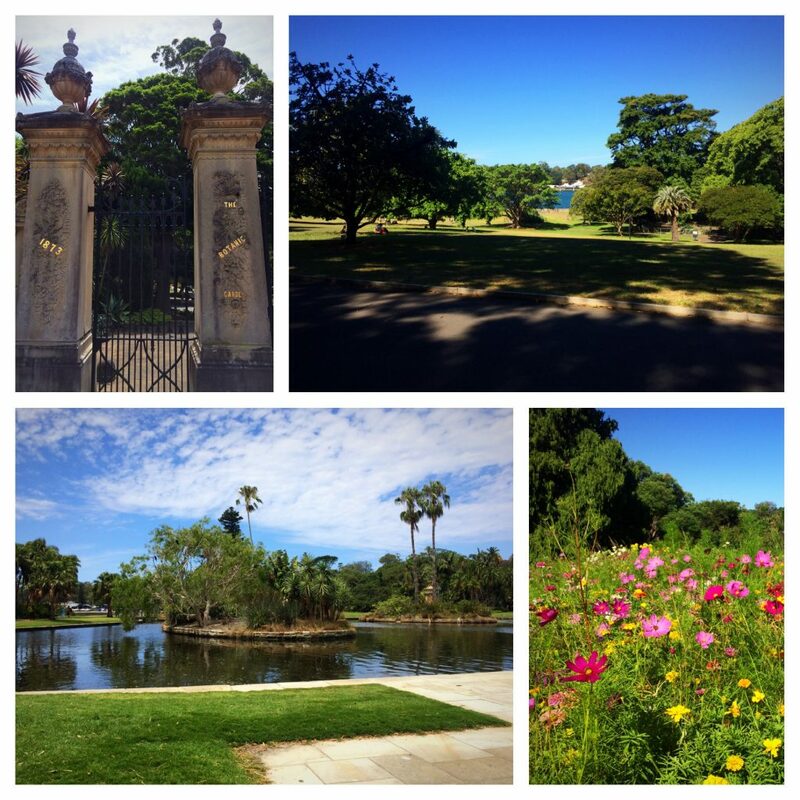 I decided to spend the last day walking through the beautifully-curated Royal Botanical Gardens, reflecting on our time together – in Thailand and Australia. As I sat in the park overlooking the city, the harbor, and the gardens, I thought about some of our random adventures and encounters. I thought about our impromptu long-tail boat ride one morning in Bangkok on our way to visit the Royal Palace that had David swearing at me in all kinds of words and gestures. 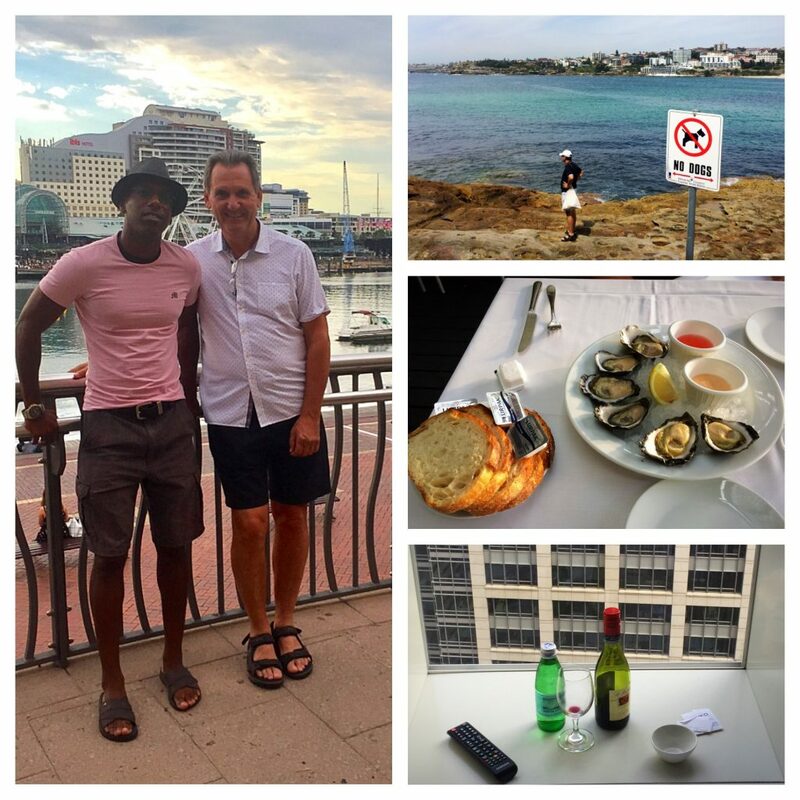 I thought about the stunningly sculpted physical trainer that he struck up a conversation with on Bondi Beach – who had just moved from Perth the previous day to start a new life in Sydney. I thought about the lady from New Jersey who sat next to us in Margaret Court Arena at the Australian Open and kept David’s attention for much of that midday match. I thought about our propensity to always end up at an Italian restaurant even though we were in Asian or Australian lands. And I thought about how simple and fulfilling the entire experience was in two countries in two months in two different continents and hemispheres. Unbeknownst to me, David’s trip had yet to end. After sitting on the tarmac of a fully loaded Quantas flight for nearly a couple of hours, his aircraft was turned back before it ever took off. Instead, he remained at the Sydney airport waiting to be rebooked on a different flight back to San Francisco. Rather than connecting back home to South Florida immediately, he decided to extend his retirement trip a few days to visit friends in the Bay Area. Sometimes what may seem like a problem can be turned into an opportunity. A few days later, we watched the Australian Open finals 6,000+ miles apart – me in Chiang Mai, Thailand and he in the San Francisco Bay Area. The simple text message that he sent me three months earlier asking for travel trips stirred a season of adventures and memories that shall now last a lifetime. At deuce, he hit a serve deep into the box of opportunity and I hoped to return it with a winner down the line. A fitting “return of serve” the second time around.